I have never done a press tour, being non-famous and all, but if the opportunity ever arose, I hope I'd get the chance to tour with the Hunger Games crew. 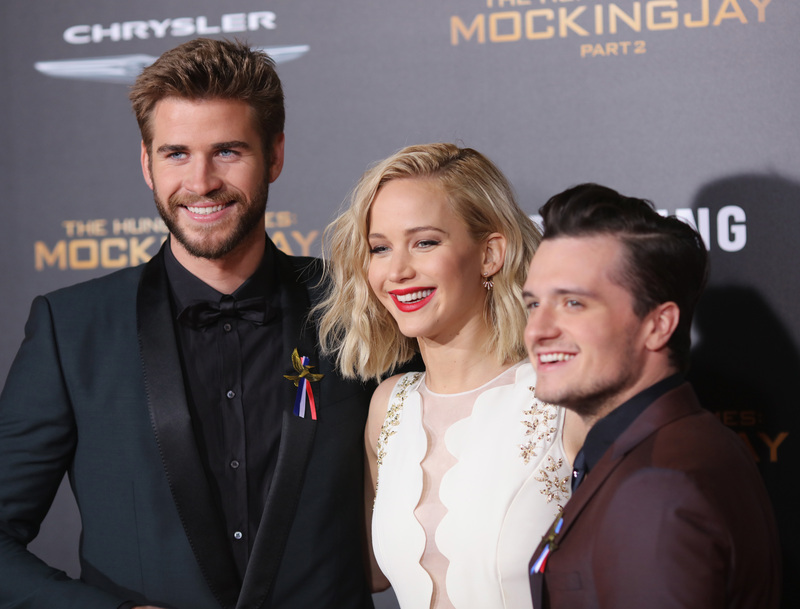 Mockingjay, Part 2 star Liam Hemsworth went on Jimmy Kimmel Live and spoke about his crazy stay in China with the rest of the cast, including besties Jennifer Lawrence and Josh Hutcherson. Much to the fans delight, he recounted the anomalies and antics that went on during their short 24-hour stay. First, before J. Law and J. Hutch even enter the equation, Hemsworth revealed to Kimmel that while trying to get some shut eye in Beijing, he suffered through multiple "horrific" dreams that left him waking up in literal tears. Yes, big bad Gale Hawthorne was scared senseless by a few nightmares. I can't make this stuff up. Kudos on him owning it, though. Nothing more endearing than a 6'3" dude admitting to the entire nation that sleeping alone at night scares him sometimes, too. But the Beijing story got increasingly more interesting when Kimmel presented a picture of Hemsworth and Hutcherson to the audience, decked out in fuzzy panda bear hats while walking the Great Wall of China. As it turns out, the panda hats were not a deliberate fashion statement, but a necessary adornment. They were chilly and there were warm hats being sold close by that just happened to be in the shape of panda bears. Imagine their luck. As if the co-stars wearing their cool new hats wasn't enough material for us to lovingly gawk at for days, the actor also cheekily urged the camera to, "Zoom right in on the Valentino handbag" that he was wearing. Basically, Hemsworth is the sweetest Australian panda bear to ever grace the Great Wall, because the Valentino was not his but J. Law's, and he was carrying it for her. *Swoon* But the laughable instances did not stop there. Kimmel asked Hemsworth if the Great Wall was, "spectacular in person," and the actor jokingly lamented that while appreciating the history behind it, the smog made it seem like they were on, "any small brick-like bridge." Oh, those poor, beautiful doofuses. What this all boils down to, is that we all missed one hell of a ridiculous time. I just want to wear panda hats and tour the world with Hemsworth, Lawrence, and Hutcherson while they take turns carrying my very expensive and beautiful handbag in a cloud of thick fog. Is that too much to ask? Maybe.